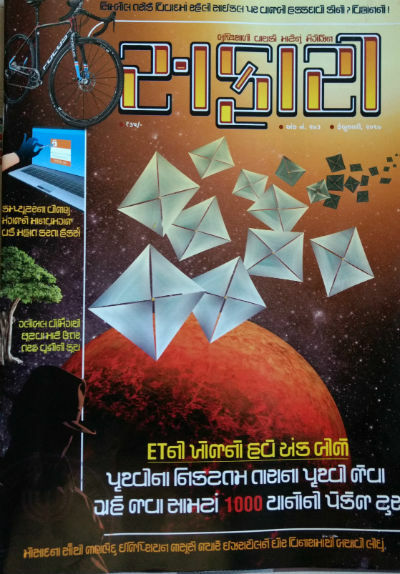 February 2017 issue of Science and Knowledge Magazine Safari (Gujarati Edition) was published quite on time. We however was busy with some other pre-scheduled stuff and thus posting the reviews for the same now. It is said that a book (or a magazine for instance) cannot be (or rather should not be) judged by it’s cover page. However, we all know that the cover page makes the first impression. And, we accept it or not, it definitely leaves a long lasting impact about the possible worth of respective media (the magazine in this case) without a doubt. The cover page of this issue is quite interesting. It gives the look and feel of a science and knowledge magazine to the issue. The editorial of any magazine or newspaper is very important part of the respective media. It gives an opportunity to the editor to convey his/her thoughts directly to the readers. This time the editor talks about the scheduled launch of 103 satellites in a single shot by using PSLV rocket launcher by ISRO. The mission was successfully carried away by one of the best space research organization of the world, which is The Most Cost Effective and Reliable, later in February 2017. Here is the video of the task completed successfully, making all of us proud of ISRO. Historical Events : The Egyptian Who Spied For Israel! If you are interested in exploring historical events, then article about Yom Kippur War will surely interest you. It is the longest article published in this issue. The good thing is, the article is not just a war account, but a lot more than that. The article explores various point deliberately including introduction to Gamal Abdel Nasser. Mr. Nasser holds a very special place in the heart of Egyptian people but many of us may not be aware with the facts. The article also introduces us to Ashraf Marwan. Ashraf turned out to be a hero (or Angel – as it was his code name :)) for Israel and a villain for Egypt. And the article explores the detail in interesting manner. The article proves to be a good reason to read about and explore the historical events. It helps us to learn from the mistakes made by others, so we do not follow them. There is a book written by Uri Bar-Joseph which explores the story in detail. We however haven’t read this book yet, but it contains good reader’s ratings at Amazon. Here are some of the external links you would like to follow, if you want to explore the history in depth. Here are some of the related videos from the public domain of YouTube. For the article we can say that it is written in interesting manner and it is spread over many pages. It is very detailed, and even made us curious to know more about the stuff and finding even more resources (some of them are listed above) related to it. So, definitely worth to go for. Often considered as the vehicle of poor, or a good sports vehicle; bicycle is often underestimated for many reasons. People often don’t think of it as the most cost effective vehicle in all aspects. Even the scientists are still searching real answers for many unanswered questions about it. Though, we feel that the article could have been more detailed, it brings a lot of facts and is worth reading. Hacking is probably most feared and misunderstood word. With the growing influence of technology on day-to-day human lives, the word is no more restricted to the IT industry only. In India also, the recent “movement” of demonetization gave a quick push to the “digital transactions”. Though, digital transactions have significant benefits, the banks and the security agencies, including the government have bigger responsibility to keep the data safe and secure. It is a big challenges, as even a 10-15 year teen with moderate skills in network filtration, an Internet connection and curiosity to explore unexplored area; can lead him/her to the super classified information. The exposed information may be worthless for the hacker, but for the shady characters and enemy countries, it can be resulted into a priceless gift. In fact, there was an article published on a website on 2nd March, 2017; claiming that the bio-metric data collected for “AADHAR” – the unique identity program of India, is not secure as expected! Many curious readers on Quora – the Q/A website – raise the same question. Here is the reference link. The question is not only for India, it haunts entire globe. Be it compromised Credit/Debit Card data for SBI or compromised user a/c details for Yahoo; such incidents are growing and will keep the cyber security personnel at toes. As said prevention is better than cure we need to follow some of the easy-to-follow guidelines to keep ourselves as much secure as much we can. The article is written in quite detail and it explores some informative stuff. However we cannot get enough information on it 🙂 as we need to keep updated regularly. An article wroth to go for, without a doubt. The article about “moving trees due to global warming” is good, but it could have been better. The title of the article raised more expectations than those are fulfilled by the article. The article about “Searching for ET” is definitely one of the nicely written part of the issue. If you are interested in space sciences, we suggest you to not to miss it. There are Fact Finder (Q/A) and other sections in the issue which answers many questions making the issue very valuable. Overall, a magazine issue which is worth to go for. The only challenge remain is, it is written in a regional language (Gujarati) and hence if you are unknown to it, you will miss a lot of quality reading material. As we see there are tons of magazine floods the newspaper stands and even online stores, there are a handful of them which are really worth your money and time. And this magazine issue is definitely one of those few. If you are unable to get the physical copy, it is available on online newsstands as well. And Safari magazine’s official website also accepts subscription for digital copies. Please don’t get illegal copy by any means and support it by buying a genuine copy. This magazine needs to be saved from being bankrupt or going out of market.